Sara's Beauty, Product Reviews, and More! Honest Reviews, Favorite beauty Items, and much more! 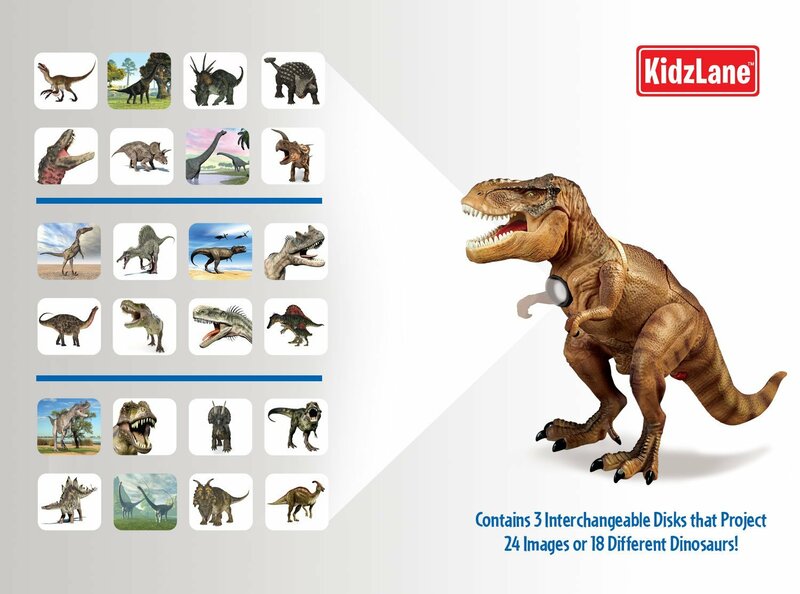 This is a great gift for a little boy (or girl) in your life that loves dinosaurs! This T-Rex dinosaur toy is a great figure just to collect but it does some pretty cool stuff. This is so perfect for your kids room! It has a motion sensor that detects when someone is coming in and it lets out a mighty roar, five different roars in fact so you don’t get bored of the same sound. It also has a built in trembler alert. If this starts to annoy you parents, no worries, you can switch it off. Even COOLER is the fact that once you turn the lights down, your child’s T-Rex toy turns into a projector! It projects 24 different realistic images on to the wall. Three disks come with the toy to alternate between dinosaurs. So I became the coolest person ever when I gifted this to the special little man in my life. We set it up in his room and he was eager to see the dinosaurs. It works absolutely great. I recommend facing it towards a white wall to get the best image quality. He also loves the motion detector, he now thinks his room is a top secret space and every time he hears his dino roar he goes running to see who’s in his room! Usually it’s just me, but it has startled me a few times lol. He likes it when I tell him how scary his T-Rex is and it will keep him protected. He is really enjoying this toy and I am enjoyed seeing his eyes light up when he received it. I received this product in an exchange for an unbiased review. It’s very important for me to regulate my diet because I have diabetes. I have found the weighing my food helps control how much I am eating and helps me count my carbs and calories. I use apps on my smart phone where I record how much food I am consuming. With this scale I am able to accurately count the calories I am eating. This precision digital scale has not failed me, over the last month I have lost 7 pounds and I think this has been very helpful in aiding me shed the weight. The name of the scale is spot on, it is very precise. You can set the mode to use whatever measurements you prefer, I prefer ounces but you can set it to grams as well. It has a large but lightweight bowl that comes with the scale. The bowl makes it easy to weigh larger food items. 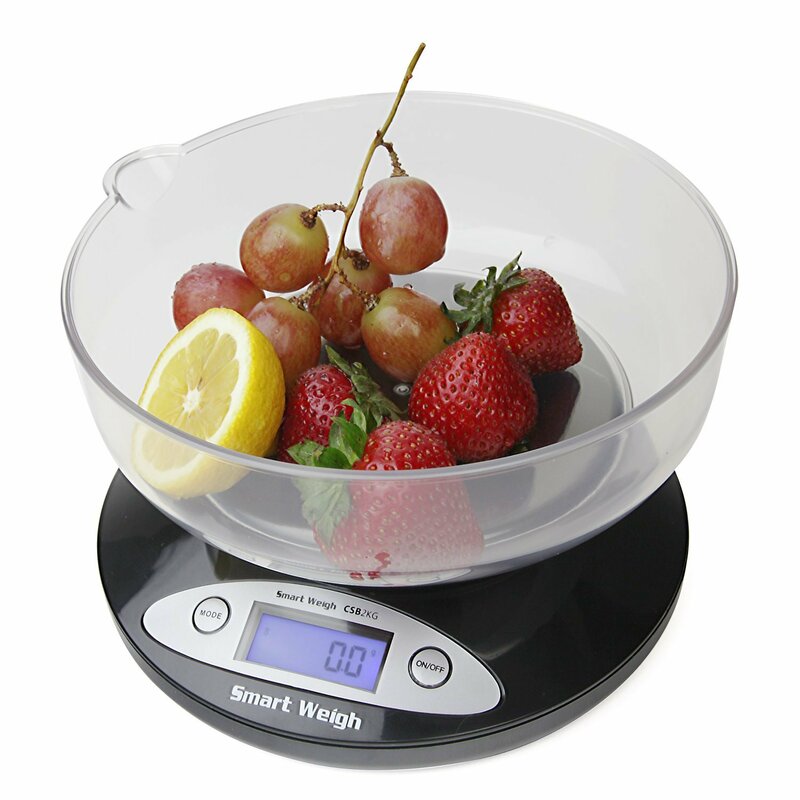 If you don’t prefer the bowl, you can also weigh your items directly on the scale. It weights items up to 4lbs and has an easy to read display with blue high contrast back lights. I highly recommend this to anyone who is interested in losing weight by counting their carbs and calories! *disclaimer* I was provided this product in exchange for an unbiased review. In previous blog posts, I have covered the importance of using moisturizers, serums, toners and sun blocks, but I have yet to go over while exfoliating is also an important factor of your skin care routine. Getting older means we have to tend to our skin more, the process of skin cell regeneration slows down, which means our skin cells are shedding slower. The old skin cells can leave your skin looking dull, dry and rough. Exfoliating helps shed those old cells to reveal healthier, brighter skin. It also removes blackheads and helps fade acne scarring. 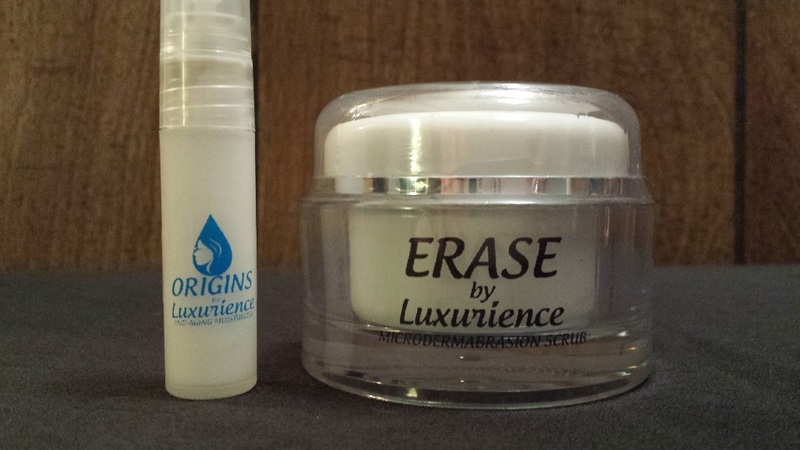 I was recently sent a great product to review called Erase Luxurience. This exfoliating scrub is non-greasy and contains tiny crystals to help gently buff away your dead skin cells, dry skin and clogged pores. The smell is light and not overpowering, it has a fine texture so you don’t have to worry about it being over abrasive for sensitive skin. I have used this twice a a week for the last month, and I’m seeing results already! I use it on damp skin and scrub in circular motions for 2 or 3 minutes. My face started looking brighter immediately. The overly large pores on my nose seem to be shrinking and I can no longer see dry patches on my cheeks. They also send a free sample of moisturizer when you purchase this product! *disclaimer* I received this product in exchange for an unbiased review. 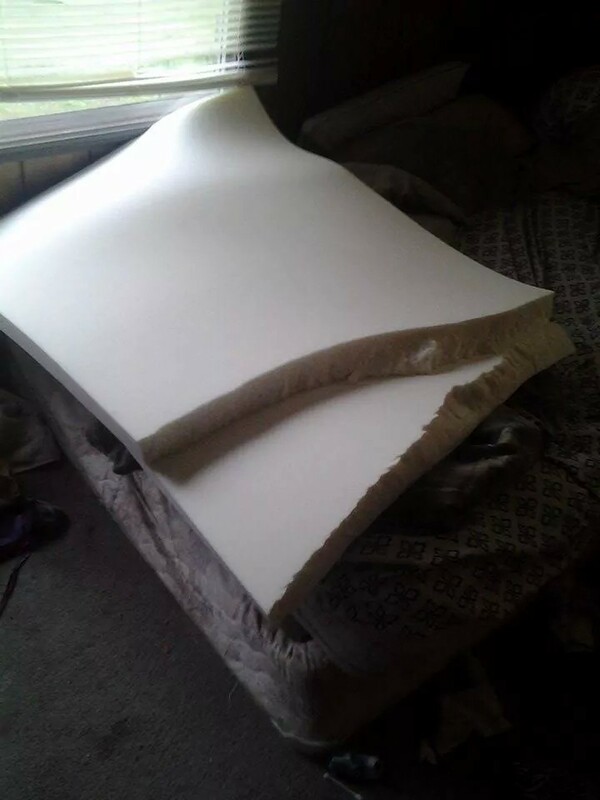 Elastic Memory Foam Mattress Pad Bed Topper – Buyer Beware! I don’t normally like to blog about things I didn’t have a good experience with but I also would hate for someone to waste their money on this. I was really excited about this until I got it! It fits a twin bed just fine, I had a problem with it sliding off but that isn’t unusual for foam toppers. It didn’t come in any protective material, it’s basically just a piece of memory foam. It was comfortable, I will give it that. Here is where my problem comes in, I folded it in half… not completely because of how thick it is, I just gently folded it over. I put in on my closet floor for storage. I went to put it back on my bed and the foam had torn completely in half! No excessive force, just from simply being folded over, it tore in half. So here I am with a giant piece of foam garbage that I cannot use. If you don’t plan on storing this, just keeping it on your bed it might be okay for you, but I don’t think it’s worth the money. I received this product in exchange for an unbiased review! 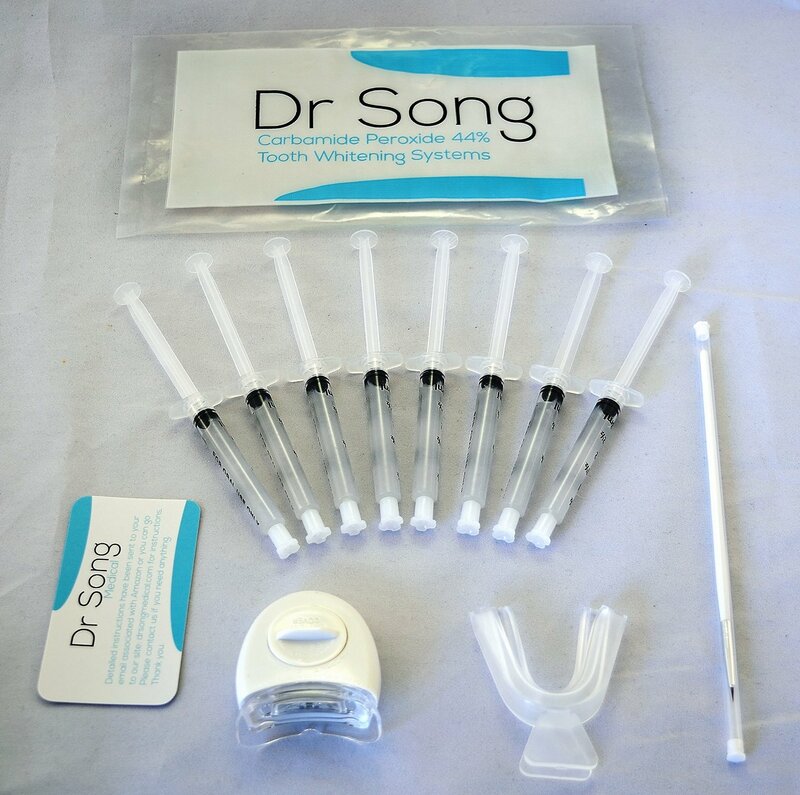 If you are looking for an affordable way to whiten your teeth at home you can try Dr. Song’s Teeth Whitening Kit. This kit will be good for about 50 uses. The kit contains with Gel applicators, an LED light to help the whitening process and trays that are formable to your mouth and a brush to apply the teeth whitening solution. The first thing I had to do was boil the trays so I could mold them to the shape of my mouth, it took a couple of tries to get it just right. This was probably the biggest pain of the process but unless you are going to a dentist to have it done professionally there is no way around it. When applying it make sure it stays away from your gums because it could whiten them and cause irritation. I’ts recommended to only whiten the front teeth that you can see when you smile. Once you get the process down it gets easier, but the taste isn’t the best. You can keep the solution on anywhere from 15 minutes to 4 hours. I kept mine on about 30 to 45 minutes. The LED light will help enhance the whitening process. I still need to use this a few more times before I can tell you how effective it is but I am super excited to see the results! If you have sensitive teeth you can also purchase their remineralzation kit that you use afterwards, it will help desensitize your teeth, restore minerals and help strengthen your enamel. My first thoughts on this product? I was intrigued… skeptical.. and a little scared I was going to burn my face off. Dr. Songs Lactic Acid peel is designed to basically burn layers of skin off your face (it’s safe if used properly don’t worry) Your skin will gradually start peeling, as if you had a sun burn but without all the sun and with just a little sting. Once those layers peel off, it reveals fresh, smooth, soft baby like skin. 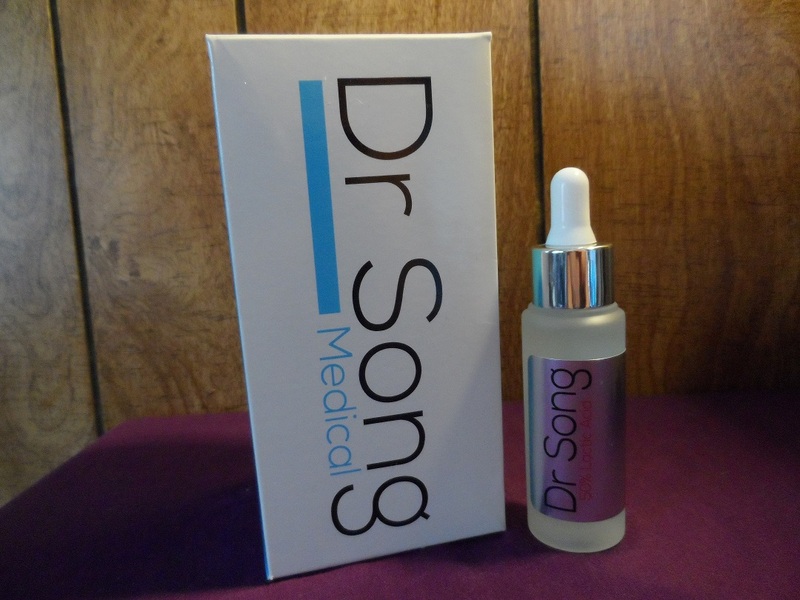 You dark spots are lightened, your melasma has faded and your fine line and wrinkles have faded. You need to follow the instructions very carefully (which you have to look up online, I thought that was kind of strange) This is not like getting a chemical peel from the doctor, your face wont look like hamburger afterwards, don’t worry. This is used once a month for gradual results. So here is my personal experience…I thought, what the hell, let’s try this and see if I can get professional results from home. It comes in a small vial with a dropper attached. I took the dropper and just dabbed it right on my face, not knowing what to expect. OMG I got it too close to my eyes! lol It burned, I washed it off with cold water and it immediately neutralized the burning sensation. Let’s try this again shall we…. I grabbed one of my foundation brushes and used it to gently wipe the product over my face, this time there was minial burn. The instructions stated to leave one for ONLY ONE MINUTE, and add an extra minute the next tie you do it a month later. So I literally counted the seconds because it started to sting a little more every second. One minute passed and I jumped up, rinsed off my face. My face was slightly red, the stinging was gone as soon as I washed it off. My face felt soo soft. So I wondered if that was it, just a soft face? About 12 hours later I noticed the skin around my nose started to look bumpy. That was actually the part of my face that stung the most, my skin is always very sensitive,flaky and red in that area. The next day, the area around my nose was very bumpy, not to be gross, but It was like a flesh colored scab. I was worried, I thought I had chemically burned my face. I resisted the urge to pick it and after about 2 days it started shedding. Eww, I know… It came off and underneath that was fresh new skin, without any of the flake that I used to have. The redness had faded to a light pink. I was IMPRESSED. This stuff actually works, and I can’t wait till my second round to see what other results I can achieve. I use my phone quite a bit, It is never far from me, therefor it tends to die a lot, especially as the phone gets older. I am not the most prepared person either and have brought my phone with me, barely charged to a place where there is no way to charge my phone. I have broken down in trucks, in the middle of the woods because my husband and I like to go wheelin’ in his lifted truck, which isn’t capable of charging a cell phone, and quite capable of breaking down! Ugh! We had to hike out a few miles to the nearest road, in winter on Super Bowl Sunday, there was practically no traffic on the road. It was a nightmare! I Most recently I went to a concert, without my phone all the way charged and couldn’t take all the pictures I wanted because I had NO way to charge my phone. These type of things happen to me a lot because, like I said, I am not the most prepared person. This is why I LOVE this mini portable charger. I can take this anywhere and it charges my phone without the need of an outlet. 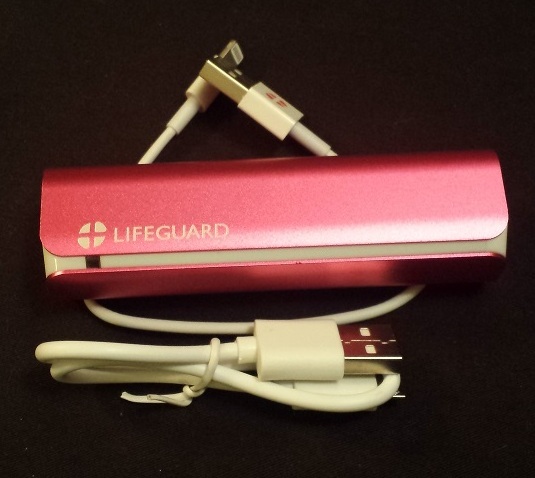 This small, cute and PINK charger fits easily into my purse. It will charge your phone up to 800 times before you need to replace it. I think every one should have one of these, it’s a great way to be prepared for an emergency and you have no way to charge your phone. This would make a great gift for a loved one! They come in many colors to suit your personality. Not only can it make a huge difference in an emergency its also really adorable and is a cute phone accessory. This works perfectly with my Samsung Galaxy s4. It also comes with a bonus mini lightening cable for an Iphone.